IT'S YOUR MONEY--THEY'RE YOUR CREEKS! The people who will have to pay for this $20 BILLION project, we taxpayers, can tell our elected officials that we want a natural parks- and wildlife habitat-creating plan to clean up our polluted beaches and creeks. October 20th, 7:00PM, Learn What You Can Do! 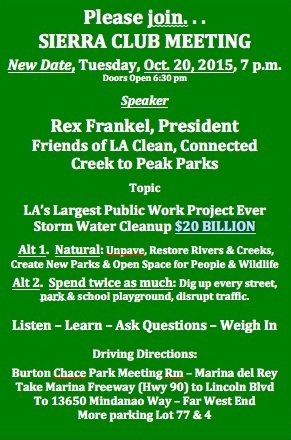 Rex Frankel will speak about the largest public works project in Los Angeles' history, the $20 Billion beaches, rivers and creeks stormwater pollution cleanup plan (known officially as the Enhanced Watershed Management Plan). This plan will have huge impacts on every river and creek in our County. Two proposals are under consideration. Frankel will describe the two plans: one uses natural methods to clean up water pollution by unpaving, expanding and restoring our County's rivers and creeks and planting natural pollution-filtering vegetation. The side benefit of this plan is the opportunity to convert concrete, fenced-off storm drain channels into park greenways with trails and bike paths which will connect L.A.'s existing ring of mountain parks that surround our developed metropolis to our communities in the flatlands. For example, what if Ballona Creek's nature trails extended all the way to Griffith Park, as they once did? then the Rim of the Valley plan, http://ballona-news.blogspot.com/2015/05/what-l.html , and also the Mountains to the Sea plan and the Emerald Necklace. However, elected officials so far are favoring a plan that will not acquire and create new parks, but will instead require the digging up of virtually every street, park and school playground in order to construct water capture and filtration facilities for this pollution. And it will cost $20 BILLION in tax dollars over 20 years to construct, according to the County's planning department report. This plan has been also estimated by the L.A. County Public Works department to cost twice as much as a "natural" plan. The Los Angeles County Board of Supervisors and the L.A. City Council early this summer endorsed the no-new-parks plan with virtually no public notice. Frankel's organization, the Friends of L.A. Clean, Connected Creek to Peak Parks, has filed a lawsuit to overturn these quiet approvals and to require a full revealing of the costs and impacts to our communities. YOU CAN HELP CHANGE THIS PROJECT! However, the final decision has not been made! An additional government agency must approve the plan before it can happen. (The Los Angeles Regional Water Quality Control Board, which has previously endorsed a "natural" cleanup plan, will make its decision at a public hearing in Spring of 2016.) The people who will have to pay for this project, we taxpayers, can tell our elected officials that we want a natural parks- and wildlife habitat-creating plan to clean up our polluted beaches and creeks. ...Few know better how hard it is to unpave paradise than Rex Frankel. As director of the Ballona Ecosystem Education Project, he has long fought — futilely, in some respects — to preserve the Ballona Wetlands, 90 percent of which has been compromised by development. He has come to realize that the Ballona Wetlands’ health would improve if the county and city could fix the urban-runoff problem. And so he has also worked hard to put together the numbers to demonstrate that daylighting creeks and restoring wetlands may actually make financial, as well as environmental, sense. I write about saving cool hiking spots in California at http://rare-earth-news.blogspot.com CHECK IT OUT! I also lead hikes for the L.A. Hiking meetup group.